SERIOUSLY? 3-NIGHT STAY IN JAKARTA AT ZENROOMS SCBD FOR LESS THAN P2000! After booking a budget ticket to Jakarta via Air Asia, I thought that the next best thing to do was to book a hotel that would be easy on the pocket as well. I was going to Jakarta to attend two meetings. The venue of the first meeting was located at the client’s office in South Jakarta. I opened Google maps and typed my client’s office address. After the location pin showed up, I typed “hotels nearby”. A number of hotels showed up in an instant with their corresponding room rates per night. I was easily intrigued by the room rates of ZEN Rooms SCBD at P 553.49 per night. Their online customer service was also very helpful. I chatted with Dayne and she was accommodating with my inquiries. I did not book my stay immediately because I was a little bit wary quite frankly. How can a hotel charge so low and be able to provide the amenities that they claim? So, I gave it a thought for a week. Well, honestly, I did not really have time to think about it since I was too busy. A week before my date of departure, I finally decided to take the risk and booked my stay at ZEN Rooms SCBD anyway. I mean, what was there to lose? I am not picky. I just needed a place to sleep in. Can you believe this? I only paid P 1,660.46 for a three-night stay in Jakarta, Indonesia! Upon arrival at the CGK or Soekarno–Hatta International Airport in Jakarta, I grabbed my mobile, clicked the GRAB icon, inputted ZEN Rooms SCBD and requested for a GRAB driver. I paid IDR 128,000 or PHP 486 for GRAB and IDR 35,000 or PHP 133.00 for toll fees. Arriving at the hotel, it almost felt like I was coming home to my former apartment in Project 8, Quezon City. It was homey and I was welcomed by Echo, the receptionist aka caretaker. I received a ZEN Rooms Toiletries Bag containing a bottle of shampoo, bath gel, soap and a dental kit. The room was tidy and smelled clean. Of course, it was not a five-star hotel accommodation but it was decent and just right for my budget. It had good air-conditioning, LCD TV with basic cable channels, personal refrigerator, safety deposit box, closet and two bottles of complimentary mineral water. The room had a wall clock but no battery. LOL. ZEN Rooms SCBD Jakarta offers budget accommodation with good air-conditioning, LCD TV with basic cable channels, personal refrigerator, safety deposit box, closet and two bottles of complimentary mineral water. Unfortunately, there was no hot shower. But who needs one anyway when in tropical Jakarta? There was also no adapter available. Good thing I brought my Air Asia Travel Adapter. ZEN Rooms SCBD Jakarta offers 20 sq meter rooms with a Queen size bed and toilet and bath. So if you are a smart traveler, you might want to choose ZEN Rooms in Jakarta, Indonesia. ZEN Rooms operates in Southeast Asia’s top destinations offering quality and affordable accommodation. They have 5,000 rooms across 50 cities in 7 countries. With ZEN Rooms, I was able to spend less on accommodation and got extra money to go around Jakarta and spend on good food. By the way, I have a discount coupon code that you can use valid until June 27, 2018. Just click here. Avail of $20 discount* at ZEN Rooms Hotels when you travel to Indonesia, Philippines, Thailand, Singapore, Malaysia, Sri Lanka and Hong Kong. Here is another smartphone that I am so excited about. Finally, the all-new Vivo V9 is here! Price is Php17,990. Pre-orders will be accepted from March 26 to April 2, 2018. Availability is on April 13. Vivo Executives answering the media’s questions during the Q&A. The opinions, representations and statements made within this press release are those of the author and not of http://www.joelandrada.com as a whole. Any copyright remains with the author and any liability with regard to infringement of intellectual property rights remain with them. This blog site accepts no liability for any errors, omissions or representations. REDMI 5A FLASH SALE ON MARCH 23 FOR ONLY P 4,390! Catch the next Redmi 5A Flash Sale on March 23 at exactly 1 PM with the discounted price of P4,390! Hurry as they will surely run out fast! Remember to click here when you purchase this entry-level smart phone on March 23 at exactly 1 PM. For more information about Redmi 5A, the entry-level smart phone, click here. Kwikset has always been a part of our household for as long as I can remember. I have always thought that Kwikset was a local brand. I mean why call it Kwikset rather than Quickset, right? It was only when I attended Kwikset’s Roadshow last March 15, 2018 at the Blue Leaf Filipinas that I learned about Kwikset being the number one selling U.S. lock brand. I arrived an hour before the start of the roadshow. That is why most of the photos shown here would lack a lot of people in it. LOL. The event was attended by media and potential customers and dealers. I met Elaine Bersamin, Sales Director, at the reception area and told me to go around first while waiting for the event to start. She also offered to safekeep my drone for my convenience. Dave Albert, Vice President and Managing Director of APAC Spectrum Brands Inc., welcomed everyone and gave a brief history of Kwikset. He said that Kwikset is the largest tubular lock manufacturer in the world with a production output of 250,000 door locks per day. They have manufacturing sites in China, Mexico, the United States of America and the Philippines. Kwikset’s manufacturing site in the Philippines is located in Subic, Olongapo City, Zambales employing close to 5000 Filipinos. Kwikset, the pioneer in residential locks with a tubular design, was launched in 1946 by Adolf Schoepe and Karl Rhinehart. It was named Kwikset to highlight its speedy installation. In the Philippines, Kwikset has been commercially available since the 1980s. Kevin Sander, International Brand Manager, discussed Kwikset’s brand premise and promise that is “Made for the world you live in.” And during Kwikset’s Roadshow, we witnessed firsthand how durable, innovative, stylish and secure Kwikset really is. We were divided into small groups and each group was made to visit three stations in rotation where each of Kwikset’s brand promises of Durability, Innovation and Style were showcased. The groups then reconvened for the fourth brand promise of Security. Sander showed us how Kwikset locks are strong, secure and reliable. He put two door knobs, a Kwikset and a competing brand, to the test by soaking them in ammonia. After ten minutes or so, the competing brand corroded and turned black while the Kwikset door knob retained its shiny and golden appearance. Sander also shared that every one of their products is put through rigorous third party testing and certified to meet or exceed both ANSI (American National Standards Institute) and BHMA (Builders Hardware Manufacturers Association) standards. All Kwikset products can withstand whatever life throws at them. We then moved to the next station where we learned about Kwikset’s dedication to research and development. Kwikset has innovative locks powered by technology that not only changes how their locks work but more importantly provides convenient features that can change how people live. Highlighted during the event was Kwikset Electronic Locks which are locks operated by an electronic touchscreen or keypad and have a back-up keyway. Electronic Locks lock and open using an access code which can be personalized. For more information about Kwikset Electronic Locks, click here. Another product line showcased was the Kwikset SmartKey Security. It uses a patented technology that protects against advanced break-in techniques. This technology also allows the owner to reset the lock himself in a jiffy. Watch the short clip below about how six of America’s top locksmiths tried to pick Kwikset locks with SmartKey technology. For more information about the Kwikset SmartKey Security, click here. Kwikset also has door hard wares that have an added layer of protection against bacterial growth. This product line features the Microban technology. For more information about the Kwikset Microban, click here. At the third station, we learned that Kwikset products are crafted without sacrificing security for style. Both departments of Marketing and Engineering work together to come up with tediously designed products. Kwikset products are crafted without sacrificing security for style. Both departments of Marketing and Engineering work together to come up with tediously designed products. At the last station, Sander demonstrated how Kwikset deadbolts offer superior security and prevent against common forced entry attacks. Watch the video below to see how Sander used a saw and even asked volunteers to use a hammer to test Kwikset’s brand promise of security. Sander reiterated that Kwikset products are put through rigorous third party testing and certified to meet or exceed ANSI/BHMA standards. Kwikset is available in modern and traditional trade outlets. The Smart Key Technology will soon be launched in the next six to twelve months and shall be initially available in Wilcon Depot. Top executives of Herco Trading Inc., the number one hardware distributor in the Philippines, also attended the affair. According to Noel Chan, Department Manager of Herco Trading Inc., Kwikset will be more visible than ever in trade. He affirmed that after the Kwikset Roadshow, more exciting trade activities should be expected as they prepare for the surge in demand for Kwikset. I left the roadshow with a brand new appreciation for Kwikset. I learned that a lock is not always a lock. Only Kwikset can guarantee security and style for life. Other Spectrum Brands were also on display. Yesterday, March 17, 2018, I had the most wonderful opportunity to attend and cover Air Asia’s Red Hub Convention at The Axon at Green Sun in Makati City, Philippines. Thank you Air Asia. As a BIG Member, it was a privilege and an honor to be covering this event. AirAsia, the World’s Best Low Cost Carrier, held a digital convention for digital nomads and entrepreneurs at the The Axon at Green Sun. The convention focused on the culture of digital nomads and how AirAsia connects them across Asia. Who or what are Digital Nomads? They can vary from self-employed freelancers or full-time employees, often of start-ups. Digital nomads are internet-savvy individuals who earn their living from a distance. They usually move from one place to another from co-working spaces to coffee shops to beaches, both in Manila and in other parts of the world. Me with fellow digital nomads: self-employed freelancers, full-time employees who move from one place to another locally and abroad. Yes, I am a digital nomad. You see, I have been self-employed after leaving the corporate environment in 2016. With the lack of a better term then, I would call myself an online nomad, working outside cubicles and the usual working hours as an online content producer/creator. I first learned about the term digital nomad two years ago and how digital nomads, mostly foreigners, have crowded the internet cafes and coffee shops in Bali, Indonesia, sharing work spaces while waiting for the next wave to surf. The term digital nomad or diginomad was all too foreign then. It amazes me how fast it has become popular locally in just a span of two years. Now there are more virtual offices and co-work spaces and more jobs offering flexible work schedules and work-from-home options. AirAsia Philippines CEO Captain Dexter Comendador welcomed everyone by how AirAsia supports the growing needs of these digital nomads in the workplace. Me and Kenneth Surat with fellow Travel Blogger and Red Hub Convention Speaker Trisha Velarmino who told us that being a Travel Blogger is a profession. Be proud. You worked and should continue to work for it. Facebook remains to be the biggest “nation” in the world with 2 billion active users. The Red Hub Convention came at a perfect time for Filipinos, especially with more people venturing into their own businesses. Manila is fast becoming one of Southeast Asia’s growing startup hubs. Fellow Travel Blogger Rona Beltran striking a pose. Although the startup scene in the country may be young, it has a lot of potential for innovation and the recent convention encouraged our fellow Filipinos to step up and step out of their comfort zones. Through AirAsia, Filipinos now have the opportunity to explore business beyond borders while continuing to thrive in entrepreneurial pursuits. With Air Asia’s low-cost and efficient flying options, digital nomads can now easily travel across different cities in Asia and look for business opportunities. The Red Hub Convention was perfect for whether you’re a digital nomad, industry expert or social entrepreneur. The convention ended at four in the afternoon. I had a grand time connecting with other digital nomads from different segments of the online world. I believe I gained enough confidence after learning that there is indeed a bright future for me as an Online Content Creator and a Travel Blogger. I just need to be authentic, consistent and persevering in publishing relevant online content for the 3.6 billion people who are online. Got to go! Every minute counts. I need to finish stuff here in the Philippines before I board a plane to Jakarta (of course, via Air Asia) tomorrow morning. Signing out for now. Peace! There are 3.6 billion people who are online per minute. It’s Zooper Zummer once again and of course, we are launching the only theme park activity at night which received a nice raved from the patrons. Stay awake, hear your heartbeat pounding, blood in your veins rushing as the rising excitement heightened in the night’s summer breeze. Zoobic Safari brings back the much awaited “Night Safari”, packed with more thrill and excitement. Discover your braver side and tour around this exotic sanctuary at night, the first of its kind in the Philippines. Gear up your nocturnal senses and prepare for a series of roaring nights of fun in visiting Zoobic Safari’sclassic attractions, Serpentarium; a wild encounter with snakes, lizards and iguanas, Zoobic Park, a walk-through petting zoo, Tiger Safari, an enclosed safari jeep ride that will take you to the tigers’ natural habitat, Croco Loco, a crocodile lair where you will have a chance to feed them. Take a walk together with the greyhounds and follow the night trail in Greyhound Walk.. Enjoy a different and bolder show specially prepared for the night’s entertainment; expect an explosive presentation that will surely growl your mind away. Anticipate a wilder quest as Zoobic Safari offers you its latest feral attraction, the Lion Safari on a day adventure. Witness these ferocious Kings of the Jungle up close and more intimidating. Night Safari Tour (Zoobic Park, Serpentarium, Zoobic Cave, Forbidden Cave, Tiger Safari Ride, Greyhound Walk, Croco Loco) for approximately 2 hours. Package 3: ZOOBIC NIGHT SAFARI AT 30% OFF! Acceptance of guests starts at 5PM up to 8PM only. Night Safari show starts at 8PM. All Saturdays from Mar 3, 2018 to May 26, 2018. Experience the wild nights and see the other side of time of the animal kingdom. For inquiries contact 09778978877 or visit www.zoomanity.com.ph. TAG Media and Public Relations handles Zoomanity Group for Marketing, Branding, Public Relations, Events and Promotions. The opinions, representations and statements made within this guest article are those of the author and not of http://www.joelandrada.com as a whole. Any copyright remains with the author and any liability with regard to infringement of intellectual property rights remain with them. This blog site accepts no liability for any errors, omissions or representations. Featured images were provided by client. I have been a marketer for as long as I can remember, handling both pharmaceutical and consumer brands locally and across Asia Pacific as a Regional Brand Manager. I used to handle anti-hypertensive, anti-cholesterol and specialty products. I crossed over to Consumer Marketing to handle Cherifer, the Philippines’ number one multivitamin brand. I also had the opportunity to handle Cetaphil, the Philippines’ most recommended brand of cleansers and moisturizers by Dermatologists and Pediatricians. It was during my time when Cetaphil launched its many firsts in the local market: first TV Ad, first billboard and first online presence. I am also a film maker. I studied film under the direction of the late Direk Marilou Diaz Abaya. I have done acting, production design, art direction and (assistant) directing for TV, film and TV Ad productions. Aside from blogging and video productions, I still do marketing and business development consultancy for a number of multinational companies locally and regionally. As a film maker, my mentor, Direk Marilou Diaz- Abaya, always stressed the importance of the “WHO” in effective storytelling. She said that the story should remain consistent to the subject’s core and his or her significant human experience. Sounds very similar but different, huh? Well, it all boils down to knowing who the customer (marketing) or who the subject is (film making) and tailor-fitting the communication strategy or the storytelling without compromising the brand premise and promise or the truth and the signification human experience. It is because of these key personal learnings that I got all pumped up when I heard about the First Consumer Insighting Conference happening on April 26-27, 2018 at The Events Center at the Century Mall, Makati City, Philippines. I am attending the event and so looking forward to learn more. Registration is still ongoing. Get your tickets here. The regular rate is Php 15,500. Group rates are also available at Php 12,000 per person, if you are registering for a group of three or more. MANILA – On April 26-27, marketers, creative professionals, researchers, and decision-makers, will come together for the first Consumer Insighting and Storytelling Conference, happening in Makati City. The event, presented by Synergy Market Research + Consultancy, is the only conference that focuses on the intersection of insighting and creativity – two disciplines that are imperative for businesses today. It is a rebranded and expanded version of the company’s successful “HuGOT It Right” seminar-workshop series, which was launched in 2016. On the second day, attendees will undergo an intensive design thinking workshop, where they will get the chance to solve on a consumer insighting case study from a featured local brand. This will be facilitated by Miguel Aranaz, an innovation and design strategist and a serial entrepreneur, with an MA in Image and Communications at Goldsmiths University in London, and an alumnus of Stanford School. 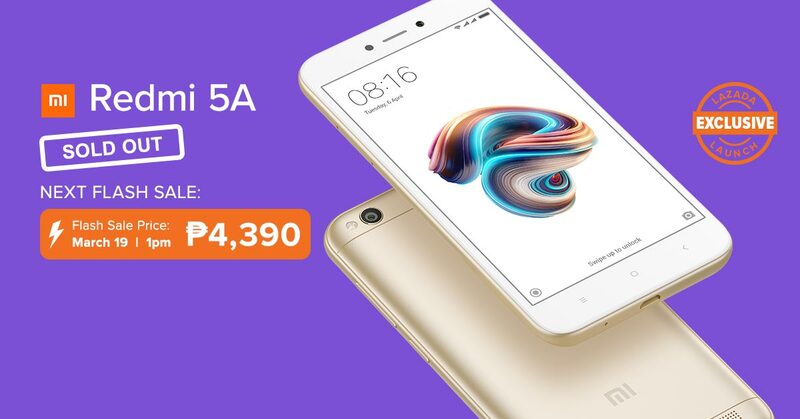 LAZADA’S REDMI 5A FLASH SALE: SOLD OUT IN LESS THAN 1 HOUR! Lazada’s flash sale of the Xiaomi Redmi 5A was a success selling out the available stocks today in less than 1 hour! The Redmi 5A was such a hit with its flash sale price of only P4,390. Featuring a Snapdragon 425 64-bit quad-core processor, 16GB of ROM expandable to 128GB, a 2GB RAM and a 13MP rear and a 5MP front camera, the Redmi 5A is one of the most feature-packed smartphones below the 5000-peso range. With another batch of shipment already on the way, Lazada has confirmed that the next date of the flash sale will be next week on Monday, March 19, at 1PM. Both the dark grey and the gold version will be available next week. To those who were not fast enough to get the Redmi 5A today, mark your calendars and set up those alarms for next week! Your best trip ever starts with TravelBook.ph’s Destination: PH! TravelBook.ph, one of the country’s leading online travel agencies, will be having its first travel fair entitled “Destination: PH” from March 16 to 18, 2018, at the 4th Floor, Activity Center, Century City Mall in Makati. As part of TravelBook.ph’s objective to promote the country’s most beautiful destinations, this event will be an avenue for customers to get amazing and exciting offers from its hotel and tour partners as well as flight loyalty program partners. Lots of prizes and freebies will also be given away. Each event attendee will receive one (1) FREE admission ticket with numerous stubs that will entitle them to discounts on the following hotels when they book through TravelBook.ph: 40% off in Circle Inn Iloilo, Circle Inn Bacolod, Azalea Resorts and Residences Baguio, and Azalea Resorts and Residences Boracay; 30% off in The District Boracay; and PHP 1,000.00 off in all hotel partners for a minimum booking amount of PHP 4,000. In addition to these fabulous discounts at the event, over 100 hotels and tour activities from TravelBook.ph will also be on sale! Tourism industry professionals will also be gracing and conducting talks at the three-day event. Among these are Senior Tourism Operations Officer Ms. Azucena Pallugna from the Department of Tourism’s (DOT) Office of the Undersecretary for Tourism Development; travel blogger Mr. Arjay Abellara of RJ D Explorer blog; illustrator, designer, travel blogger, and contributing writer for ABS-CBN and Travel Now magazine Ms. Sheena Gonzales; lifestyle and travel blogger Ms. Arnie Villanueva of ArnieVillanueva blog; and travel blogger Mr. Rogelio Gabiano, Jr. of the Pinoy Travel Freak blog. Actor and model Daniel Matsunaga will also be present in the event to share stories of his travel experiences and to participate in a meet-and-greet. Plus, Japanese comedy trio HPN3 from It’s Showtime’s The Funny One will entertain the attendees with their hilarious skits. TravelBook.ph made it even more exciting as attendees will get a chance to win prizes from the following sponsors: Azalea Hotels and Residences Boracay, Midori Hotel and Casino, Subic Bay Yacht Club, Siglo Suites by Century Properties, The Dessert Museum, Enchanted Kingdom, Zoomanity Group, Inflatable Island, World Traveller Bags and Luggage, AirAsia BIG, GetGo, and Mabuhay Miles. Everyone will also be bringing home some cool freebies! Interested attendees can pre-register for the event by visiting TravelBook.ph’s event page for Destination: PH on Facebook and clicking the pre-registration link under the details section. Each visitor who pre-registers through this link automatically earns a raffle entry for a chance to win an overnight accommodation at Midori Clark Hotel and Casino in Pampanga or Subic Bay Yacht Club with breakfast for two! Start your summer adventure with TravelBook.ph and have the best travel experience ever! See you there!